This article was published in The Hindu Survey of the Environment 2009 (pages 113 – 118) without the supporting footnotes. The original article with footnotes and photographs is reproduced here. Crunch! Splat! Thud! A daily massacre is occurring under the wheels of our vehicles. Thousands of lives are snuffed out tragically, instantaneously, and yet, we hardly notice. 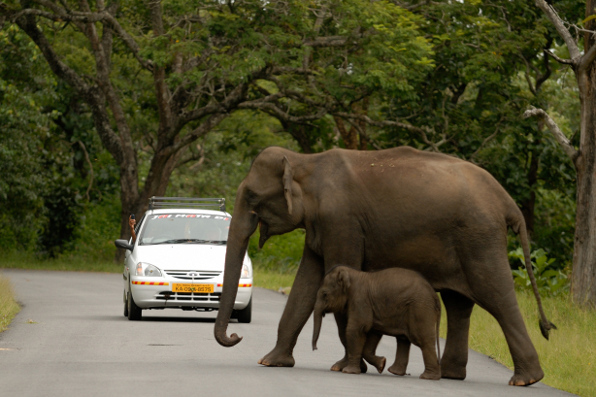 Around India, as in other parts of the world, millions of animals risk daily encounter with increasingly fast vehicles plying on an expanding meshwork of roads and highways. Roads through our countryside and forests and the people who drive vehicles on these routes cause the highest toll. This is a toll of actual lives—a headcount of animals crushed to death or else greviously injured and mutilated. Even leaving aside domestic dogs and cats, an indiscriminate diversity of wild species from butterflies, squirrels, lizards, and partridges to more threatened species such as leopard cats to tigers and lions, mouse deer to sambar and elephant, lorises to langurs and lion-tailed macaques, and sheildtail snakes to king cobras come to a sticky end. The scale of the problem is imposing. India boasts of having the second largest road network in the world, second only to the United States. According to India’s National Economic Survey of 2007 ― 08, this is no less than 3.34 million kilometres . Although only around half of this is surfaced and less than 2 percent of this comprises National Highways, the latter alone account for 40% of our total traffic. Like many things in India, the ‘total’ in that expression is a very large number indeed. In 2006, India already had around 86 million registered motor vehicles. A study  from IIM, Lucknow, records that the distance travelled in a year by a person in India (averaged across the entire population) soared from 285 km in 1950 — 51 to 3,470 km in 2000 — 01. At the time of writing, even this has nearly doubled. The study also estimates a staggering total motorized traffic volume of around 5,600 billion passenger-kilometres per year, currently. With an annual rate of increase hovering around 7 – 8%, this is poised to skyrocket to nearly 13,000 billion passenger kilometres by 2020. With such traffic, it would be scarcely surprising if animal kill rates were high, too. 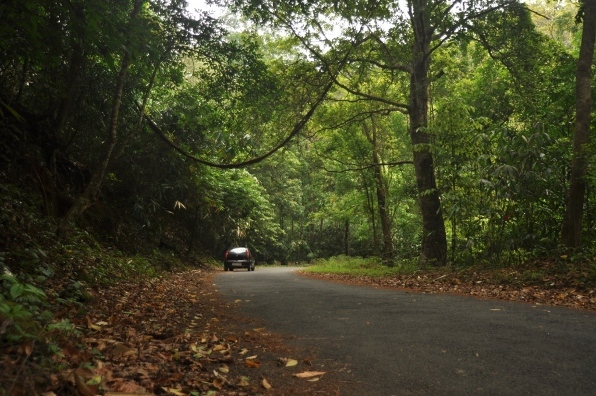 Roads passing through forest and other natural areas such as grasslands and wetlands are of greater concern from a conservation point of view. The few studies that are available from Indian forests indicate a grave situation already. Studies have documented kills ranging from dragonflies and butterflies, to many larger mammals and birds including carnivores . Around noon in Nagarahole – Bandipur in southern India, as 50 – 100 vehicles zip past every hour, a study patiently documented around 40 kills of insects such as butterflies and dragonflies for every 10 km every day, doubling over the weekends with increased traffic. A rough calculation indicates that vehicles here kill around 15,000 animals every year in just that 10 km of road . 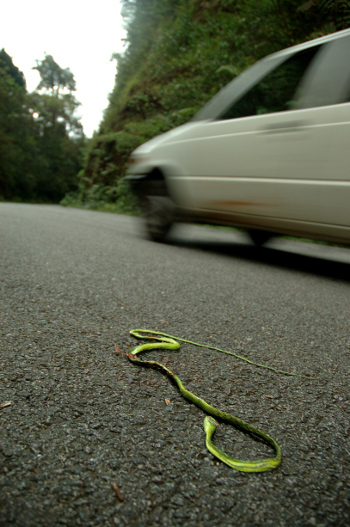 In the Anamalai hills of southern India, a study of road kills of reptiles and amphibians found that around 6 were killed per 10 km of road every day during the monsoon . Conservative extrapolation would suggest that a 100 km stretch of road through forests here witnesses an annual slaughter of around 10,000 amphibians and reptiles. Even this estimation is based on a study carried out 10 years ago when traffic volumes were much lower. Widening of roads and unregulated, ill-planned tourist influx has, if anything, made things worse. Such patterns of death on the highways are a common feature wherever roads traverse our forests, grasslands, and wetlands. Along the Western Ghats alone—a hill range much touted as a centre of amphibian and reptilian diversity with so many new species even now being discovered and described—hundreds of thousands are probably killed every year. These numbers should not make us proud that we have so many animals to subject to such wanton slaughter—that would merely be a dangerous assumption, a form of denial, or sheer ignorant optimism. Neither can we take heart from areas where few deaths are now seen along roads, until we can be certain that this is not due to populations having already been pushed over the brink. Planners and managers neglect to take the problem seriously. Even when they are aware of the issue, they feel nothing needs to be done because they believe that while many are killed on roads, many others escape and the species can survive. What they fail to understand is that the additional mortality on roads can tilt the demographic scale against a population that already grapples with various natural factors and human-caused disturbances for survival. Studies from elsewhere have revealed that the negative effects of high traffic density can be as serious as direct loss of forest cover for amphibians and traffic needs to be avoided or maintained at low density for up to 2 km around breeding ponds if frog diversity is to be conserved in the landscape . Another study estimates that even if 10% or more of the adults annually risk being killed by vehicles along roads near breeding areas, the population will eventually perish . In most cases, all that the animal is trying to do is, like the proverbial chicken, to get to the other side. The road surface and corridor itself is of little use to most animals. Perhaps a dove or myna would find some fallen scraps of food worth eating, a lizard or snake may be attracted to bask on the hot surface, as to a rock on a sunny day. Dragonflies and mayflies may be attracted to the polarized light emanating from the asphalt, a form of light pollution that fools them into believing that they are over the surface of a water body . As they fly around to feed or defend territories or even try to lay eggs on the water-road, they imperil their own survival. And then the road becomes an ecological death-trap , where the very adaptations evolved over millenia to enable these species to locate their food and thrive in their environment now nudge them to their death. The roadkill threat is not something only ground-dwelling face. The threat of roadkills is particularly acute for many tree-dwelling species that do not normally cross on the ground. With roads mercilessly slicing through our forests and government departments and road contractors recklessly widening roads and slashing all vegetation, including regenerating trees and saplings on either side, the tree cover breaks over the road. Besides loss of natural vegetation and native species typical to each area, this causes increased soil erosion and landslides. This leads to further expenditure in road maintenance—providing further opportunity for ecological damage. All of this adds to wastage of public money, while also wrecking the tree cover that would have allowed many species to safely cross the road overhead. Unable to cross overhead using the overlapping branches of intact forest canopies, the animals now face a permanent problem—a serious, life-threatening challenge—of a gap caused by the break in tree cover over the road. That crossing, even if takes only a few seconds or minutes, can be an agonisingly long and threatening one for an animal trying to cross even a moderately busy road. In the absence of tree cover, arboreal animals are sometimes forced to use electric wires of powerlines to cross, leading to the double jeopardy of electrocution deaths for species such as lorises and lion-tailed macaques . The roads and powerlines through our forests are increasingly turning into graveyards of tree-dwelling species such as monkeys, lorises, civets, squirrels, and tree shrews. Animals may also be seriously stressed or change their behaviour in the vicinity of roads. Studies from Africa on elephants and chimpanzees, have shown how they tend to avoid roads and change their behaviour, due to the associated risks as one would expect from such highly intelligent species . Other factors may compound the road problem. The building of culverts, fencerails, barricades, chain-link and barbed-wire fences, and other concrete and metal structures along roads makes the crossing even more difficult. Parapet-like walls running without a break for hundreds of metres or kilometres along roads, especially on hill roads, become insurmountable obstacles for species such as porcupines, pangolins, turtles, young birds and mammals, to name just a few. On hill slopes disfigured by such roads, even large animals such as sambar and elephants have to negotiate the upper slope, cross the road, and try to somehow step or jump over roadside walls and culverts to step or land safely on the steep lower slope. Another compounding factor is the attraction of animals to road-killed carcasses, which may lead to further deaths from speeding vehicles until the carcass is safely disposed away from the road. As roads become wider and busier, the number of animals crossing and the rate of roadkill usually increases, but beyond a point it may actually begin to decrease . This usually happens when roads become four-laned highways or expressways catering to tens of thousands of vehicles every day. The reduction may be due to the decimation of wildlife populations along the road as well as a ‘barrier’ effect, where many animals actively avoid the road and avoid crossing it . A road like this passing through a forest or key natural habitat essentially cleaves it into two pieces. For many species, this is an added fragmentation of an already fragmented habitat . In addition, roads are now well known to cause various ecological changes, leading to a wide range of impacts including many, often unnoticed, detrimental effects on wildlife . The disturbance associated with roads and the opening created by the road corridor does favour some species; unfortunately, these are mostly undesirable ones. Alien weeds spread along roads using them as highways to invade into ecosystems . The exposure along the road dessicates and dries vegetation, making it more prone to fires. Trees are more exposed, too, and may fall due to high wind speeds along the road or suffer from stress related to altered ecology. All of these contribute to permanent and chronic changes in the environment and habitat, thereby affecting wildlife and ecosystem health. Yet, this is only a small part of the story. No study has yet comprehensively addressed all animal taxa from invertebrates such as snails and ants to large creatures such as peafowl and elephants. Even the studies carried out so far may underestimate the true damage. Many animals are struck and badly wounded by vehicles along roads but manage to flee or drag themselves away from the road corridor to die unseen and unrecorded by researchers some distance away. 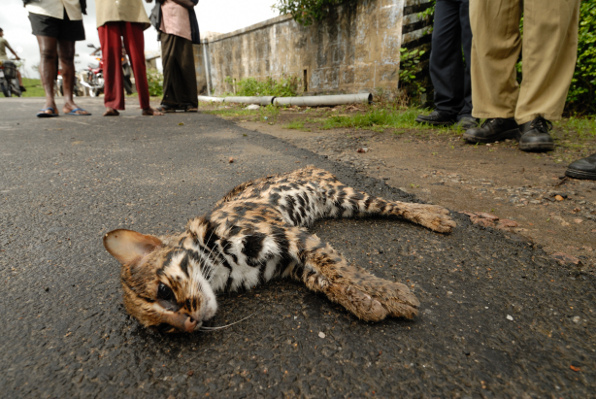 It is not unusual for road-killed animals to be removed off the road or consumed by scavengers, including people, and thereby the kills go unrecorded. Even when dead animals on the road are noticed, other pervasive problems related to the road within forest areas are overlooked. This includes animals killed during road construction, earthwork and annual maintenance operations, particularly slow-moving and burrowing species such as turtles, snakes, and soil fauna. No study has yet even catalogued the extent of roads through natural areas, especially forests, across India or the loss of forest cover due to roads. A notable exception, from Garo Hills in Meghalaya, showed that just in this region the 456 ha of biodiversity-rich forest was lost to roads between 1971 and 1991 . Another long-term aspect is the issue of increased access: people moving in and settling or polluting otherwise remote areas. While more studies on road ecology are required in India, there is also urgent need to use existing information and experiences from other countries to begin to reduce and avoid this carnage . This requires the immediate attention and close coordination of ministries and departments related to roads and forests (or other natural ecosystems). Most important, it requires the attention of the citizen, the casual driver, the tourist—particularly the vehicle-based ‘eco-tourist’—whose individual initiative, sensitivity, and care could save thousands of animal lives. A range of measures could help remedy the situation. Some are merely engineered quick-fixes that can help in certain locations or in the short-term, such as artificial ‘canopy bridges’ for movement of arboreal mammals . Other measures include proper deployment of speed breakers in roads through forests, creation of underpasses and overpasses that are well-designed keeping in mind the ecology and behaviour of the species whose mortality rate is sought to be mitigated. Signboards informing people to look out for and allow wildlife to cross and measures to check overspeeding may also be implemented. Such short-term measures, if implemented based on research that has identified roadkill ‘hotspots’ can have very positive effects. For example, the installation of just four speed-bumps along 1.5 km of highway passing through a forest in Zanzibar, helped reduced the mortality of threatened red colobus monkeys by 85% in first nine months itself. 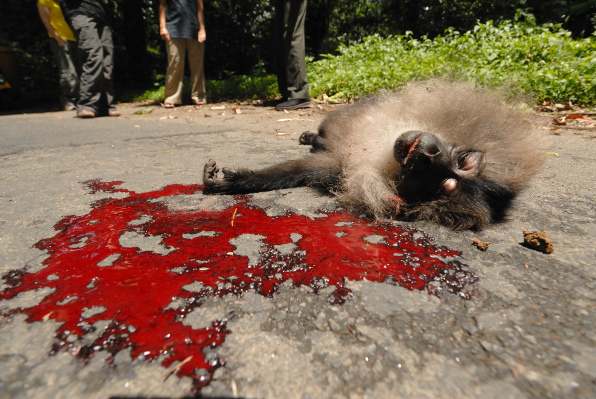 Prior to this, every year, vehicles used to kill 15% of the colobus monkey population living near the road . Slowing down vehicles at key locations is a very crucial aspect that reduces likelihood of road kill while providing greater reaction time for drivers and animals to evade a collision. Longer-term and more sustained measures require a deeper understanding of the landscape through which roads pass and a greater sensitivity to the species we share this world with. The number, extent, and width of roads passing through forests and wetlands should be strictly regulated. Improvements to the quality of the road surface and adequate signages should be the emphasis for driver comfort and safety, not increasing the number of lanes or width of the road or the speed with which vehicles can traverse these crucial stretches. As there is virtually no understanding of these issues among planners, land managers, and the wider public, despairing conservationists today regard narrow, bad roads as a great boon, one that is surpassed only by the complete absence of roads. A key long-term measure is to encourage natural vegetation on either side of the road. Currently, vast amounts of public money is wasted in slashing all vegetation on either side of thousands of kilometres of road, with the spurious claim that this improves visibility or makes the road safer. In fact, dense weed growth rapidly chokes up the opened spaces on roadsides, replacing more pleasing and open, natural, native vegetation. In forest areas where tree cover would have naturally shaded out weed growth—performing a public service at no cost and with considerable aesthetic benefits—the opened spaces with obnoxious weed growth now represent a wasteful annual cost of repeated slashing in the guise of road maintenance. The lack of any understanding that good, stable, and safe roads really need consideration of ecological aspects as well, is one of the glaring failings of the government and road construction companies. The design and adoption of regulations is urgently needed. Forest roads should mandatorily retain and maintain tree canopy connectivity over the road. Where such connectivity has been lost, at a minimum, for every 200 metres of road, a 50-m-wide stretch needs to be marked off with signs and speed breakers and the tree canopy with overlapping branches re-established overhead. Efforts to establish and maintain such stretches should begin as a top priority along all roads through our wildlife sanctuaries, national parks, tiger reserves, reserved forests, and their buffer zones. Guidelines need to be involved keeping specific species and landscape considerations in mind. For instance, in tropical forests of equatorial Africa, the home of the highly endangered great apes (gorillas and chimpanzees), the IUCN has prepared best-practice guidelines on a range of issues, including road planning . This includes recommendations to plan roads at least 5 km away from protected area boundaries, reduce road width of primary roads to less than 7.5 m (less than 12.5 m including graded portion and shoulders) and width of secondary roads to less than 4.5 m (8.5 m including shoulders), avoiding road construction in closed-canopy forests, minimising the number of secondary roads, and re-using old roads rather than build new roads. There has been some effort to develop such guidelines in India , but there is much more to be done. Forest areas around the world, including in India, are transected by a large number of old, unused, and unnecessary roads (e.g., old logging coupe roads, roads built during dam construction, or as ‘game’ roads for hunting). It is time to undo the damage wrought by these roads by actively removing these roads and ecologically restoring natural vegetation. Although the methods available for road removal may cause some short-term disturbance, research has clearly established the conservation benefits in the medium- and long-term . An overarching need, although perhaps the most difficult one, is the sensitisation and involvement of individual drivers. A vast majority of drivers probably have no deliberate will to kill animals. They presumably have no wish to cause lasting harm to the environment or to the public exchequer by insisting on roads made and managed by ecologically illiterate and insensitive agencies. When individuals become aware and begin to care it can have two useful effects. As drivers, they can adopt more responsible driving practices, watch out for and respect animal crossings, and avoid other unsavoury practices such as feeding animals by roadsides. This, as a direct contribution, can help save hundreds to thousands of animal lives over an average driver’s lifetime. Second, by example, by persuasion, or ultimately by their vote in a ballot box, they can indirectly influence others to save thousands of lives, minimise ecological damage, help to improve roads, and make the driving experience along roads through natural areas infinitely more pleasant. When the paths of people and animals cross, each can then go their own way, leaving behind not a flattened carcass but the memory of a pleasant encounter. Economic Survey 2007-2008, Ministry of Finance, Government of India. Link accessed 17 April 2009. Singh, S. K. (2008) CO2 emissions from passenger transport in India: 1950-51 to 2020-21. Proceedings of the Better Air Quality 2008 Workshop, Bangkok, Thailand. Link accessed 17 April 2009. Chhangani, A. K. (2004) Frequency of avian road-kills in Kumbhalgarh Wildlife Sanctuary, Rajasthan, India. Forktail 20: 110-111. Kumara, H. N., Sharma, A. K., Kumar, M. A., and Singh, M. (2000) Roadkills of wild fauna in Indira Gandhi wildlife sanctuary, Western Ghats, India: implications for management. Biosphere Conservation 3: 41-47. Sundar, K. S. G. (2004). Mortality of herpetofauna, birds and mammals due to vehicular traffic in Etawah district, Uttar Pradesh, India. Journal of the Bombay Natural History Society 101: 392-398. Radhakrishna,S. Goswami, A. B. and Sinha , A. (2006) Distribution and Conservation of Nycticebus bengalensis in Northeastern India. International Journal of Primatology 27: 971-982. Areendran, G. and Pasha, M. K. S. (2000) Gaur Ecology Project, Report, Wildlife Institute of India, Dehradun. Johnsingh, A. J. T., Sankar, K. and Mukherjee, S. (1997) Saving prime tiger habitat in Sariska Tiger Reserve. Cat News 27: 3-4. Rao, R. S. P. and Girish, M. K. S. (2007) Road kills: Assessing insect casualties using flagship taxon. Current Science 92: 830-837. Vijayakumar, S. P., Vasudevan, K. and Ishwar, N. M. (2001) Herpetofaunal mortality on roads in the Anamalai Hills, southern Western Ghats. Hamadryad 26: 265–272. Eigenbroda, F. Hecnarb, S. J., Fahrig , L. (2008) The relative effects of road traffic and forest cover on anuran populations. Biological Conservation 141: 35–46. Gibbs, J. P. and Shriver, W. G. (2005) Can road mortality limit populations of pool-breeding amphibians? Wetlands Ecology and Management 13: 281–289 . Horváth, G., Kriska, G., Malik, P. and Robertson , B. (2009) Polarized light pollution: a new kind of ecological photopollution. Frontiers in Ecology and the Environment 7; doi:10.1890/080129. Robertson, B. A. and Hutto, R. L. (2006) A framework for understanding ecological traps and an evaluation of existing evidence. Ecology 87: 1075-1085. Radhakrishnan, S. and Singh, M. (2002) Conserving the Slender Loris (Loris lydekkerianus lydekkerianus). Pages 227-231, National Seminar on Conservation of Eastern Ghats, March 24- 26, 2002, held at Tirupati, Andhra Pradesh; personal observations. Hockings, K. J., Anderson, J. R., Matsuzawa, T. (2006). Road crossing in chimpanzees: A risky business. Current Biology 16: R668-670. Watch movie here. Seiler, A. (2003) The toll of the automobile: wildlife and roads in Sweden. PhD thesis. Swedish University of Agricultural Sciences, Uppsala. Link accessed 11 Feb 2009. Laurance, S. G. and Gomez, M. S. (2005) Clearing width and movements of understory rainforest birds. Biotropica 37: 149–152. Laurance, S. G., Stouffer, P. C. and Laurance, W. F. (2004) Effects of road clearings on movement patterns of understory rainforest birds in Central Amazonia. Conservation Biology 18: 1099–1109. Goosem, M. (2001) Effects of tropical rainforest roads on small mammals: inhibition of crossing movements. Wildlife Research 28: 351–364. Goosem, M. (2007) Fragmentation impacts caused by roads through rainforests. Current Science 93: 1587-1595. See also this article by Rhett Butler on roads as enablers of rainforest destruction. Donaldson A. and Bennett A. (2004) Ecological effects of roads: implications for the internal fragmentation of Australian parks and reserves. Parks Victoria Technical Series No. 12. Parks Victoria, Melbourne. Fahrig, L., and Rytwinski, T. (2009) Effects of roads on animal abundance: an empirical review and synthesis. Ecology and Society 14(1): 21. Gelbard, J. L. and Belnap, J. (2003) Roads as conduits for exotic plant invasions in a semiarid landscape. Conservation Biology 17: 420–432. Bera, S. K., Basumatary, S. K., Agarwal, A. and Ahmed, M. (2006) Conversion of forest land in Garo Hills, Meghalaya for construction of roads: a threat to the environment and biodiversity. Current Science 91: 281–284. Forman, R. T. T., Sperling, D., Bissonette, J., Clevenger, A., Cutshall, C., Dale, V., Fahrig, L., France, R., Goldman, C., Heanue, K., Jones, J., Swanson, F., Turrentine, T., Winter, T. (2002) Road Ecology: Science and Solutions. Island Press, Washington, D. C. Read review here. Weston, N. (2002) Why did the ringtail cross the road? Using Rainforest Research, Cooperative ResearchCentre for Tropical Rainforest Ecology and Management, Australia. Goosem, M., Izumi, Y. and Turton, S. (2001) Will underpasses below roads restore habitat connectivity for tropical rainforest fauna? Ecological Management and Restoration 2: 196–202. See also this article about faunal underpasses. Laurance, W. F., Goosem, M. and Laurance, S. G. W. (in press) Impacts of roads and linear clearings on tropical forests. Trends in Ecology and Evolution in press. The Zanzibar Red Colobus Monkey: behavior, ecology, and conservation. DVD documentary, T. T. Struhsaker, Department of Biological Anthropology and Anatomy, Duke University, USA. Morgan, D. and Sanz, C. (2007) Best practice guidelines for reducing the impact of commercial logging on great apes in Western Equatorial Africa. IUCN SSC Primate Specialist Group (PSG), Gland, Switzerland. 32 pp. Rajvanshi, A., Mathur, V. B., Teleki, G. C., Mukherjee, S. K. (2001) Roads, sensitive habitats and wildlife: environmental guidelines for India and South Asia. Wildlife Institute of India, Dehradun. Switalski, T. A., Bissonette, J. A., DeLuca, T. H., Luce, C. H. and Madej, M. A. (2004) Benefits and impacts of road removal. Frontiers in Ecology and the Environment 2: 21-28. Countryside	Why did the Chameleons cross the road?